I want you to carve a lovespoon. 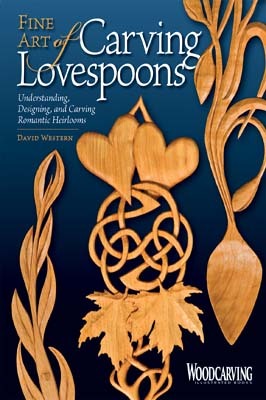 Even if your area of expertise is duck decoys, sculpture or rood screens, I am going to do my very best to convince you to try your hand at carving a lovespoon. 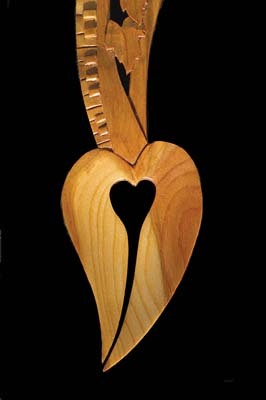 a profound gift - a statement in wood unlike any other you will ever make. It is a personal, portable artwork, which can easily convey your most heartfelt feelings in a beautiful and accessible manner. 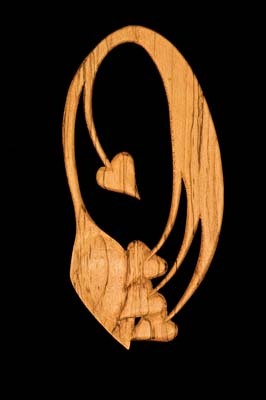 A well-designed and carved lovespoon can brilliantly illustrate all which is good about both you and the lucky recipient of your efforts! 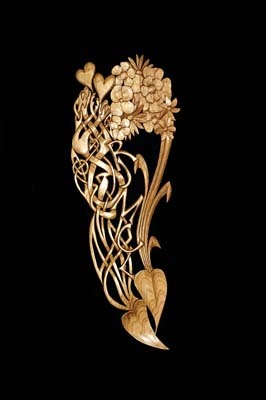 It is my hope that by showing you examples of the lovespoon's limitless array of styles, motifs and messages, I can encourage you to embrace its vast potential and create a bold, imaginative carving of your own. a simple click of a mouse will reveal cultural riches our forefathers could never have imagined. The opportunities for woodcarvers to enrich their work with the results of thousands of years of human cultural advancement have never been greater or easier. Yet, in the area of lovespoon carving, this limitless bounty seems to have been scarcely touched. A quick look at the average internet lovespoon 'gift shop' will bring up a sea of mundane souvenir lovespoons, all awash in their morbid brown stain of Victorian mourning. Trust me - nothing could be further from what the lovespoon is all about than this sorry state of affairs! 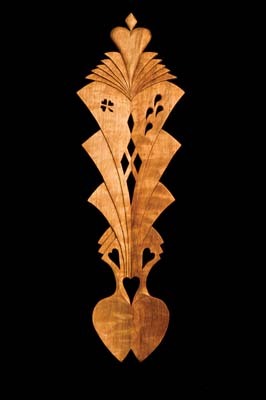 to the modern era when virtually anything can be carved, the lovespoon has always been, first and foremost, a romantic statement. 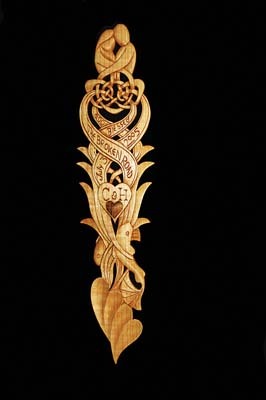 Initially, the spoon was given by a young, love-struck man to a girl who had captivated him. In some countries the spoon simply gauged mutual interest, in some it was a serious question whether a relationship could be initiated, and in yet others, it was presented at the couple's wedding as a symbol of union. 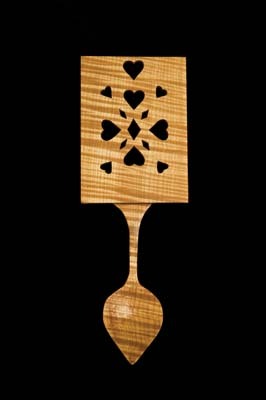 Although now rarely given for its original purpose, the lovespoon has become an effective symbol of love and romance when given at weddings, anniversaries, births or any other occasion where deep feeling or respect is being shown. It is the feeling behind a lovespoon which is its most critical aspect and this, unfortunately, is not something that can be shown in step-by-step photos. If you only take one thing away from this article, let it be that your spoon should have feeling. Your emotional involvement in the process is crucial for the success of the spoon. That involvement is why lovespoons work! When you undertake a lovespoon, don't be afraid to lavish your attention, your energy, your time and, most importantly, your imagination on it. Like those heart-struck young men of yore, this is a chance for you to really express yourself and to be free with emotions you might not otherwise allow to 'go public'. If your lovespoon is merely a quick project to get you through Match of the Day's half-time break, you can count on the results being unsatisfying and shallow. To use an old expression, you should "dance like no one is watching!" But how do you make a really good lovespoon? Perhaps the first place to start is by carving an elegant and well-crafted bowl. Most souvenir spoons you'll see have chunky, club-like bowls which appear more suited to batting six at Lords than they do to winning hearts! A delicate, smooth bowl is the ideal foil to the busy activity of the spoon's handle, its simplicity making a visual anchor at the spoon's terminal point. A clumsy bowl can absolutely devastate even the most remarkable design, so it is well worth the effort to make sure you get it right. It is at the handle where the real action happens though. This area of the spoon is one of the last great frontiers of exploration and possibility. Think of it as a Wild West where there is only one law... the law of good taste. And in true Wild West fashion, even that law is flexible. There are no rules and regulations dictating what can and can't be included in a lovespoon design - the only limitation is your imagination. Your only real concern is whether or not the design elements work well together and produce a spoon which looks unified and appealing. I'd love to be able to tell you that designing a good spoon is easy, but like anything worth doing, it will take practice and more than a couple of missteps before you get it right. That is why engaging a pencil and some tracing paper is so useful. Although there is always a great temptation to pick up some wood and get straight at it, fixing a mistake by erasing a line is much easier than gluing a block of wood back together! 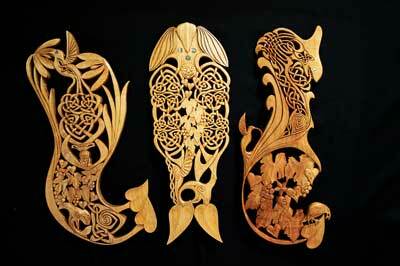 Take some time to sketch out your ideas and play with them on paper before committing to the wood you wish to carve! a lovespoon? I'll illustrate some ideas by dissecting a few of my own designs. 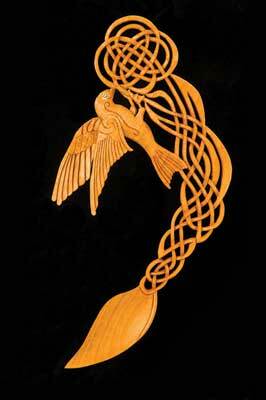 Take the Chinese Celtic Wedding Spoon for example. Here, several very different art styles have been merged to make a unified and harmonious design. 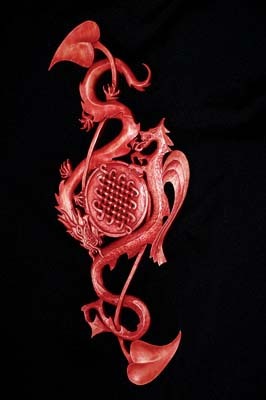 Approaching from opposite ends, the Chinese style dragon and the European Gothic dragon wind around a traditional Chinese Ming Dynasty knot, and lend equal weight and visual balance to the design. This equal balance also acts as a metaphor for marriage. The endless knot contained within a circle is a symbolic representation of eternal love, but it also acts as a focal point, drawing the eye to the middle of the design from either end. a design like this 'go off the rails' and wind up completely disjointed. Limiting the objects included in the design keeps the spoon from becoming too busy, and careful placement of those same objects creates an orderly visual 'flow' from one end to the other. The spoon feels very structured and balanced despite its visual looseness. 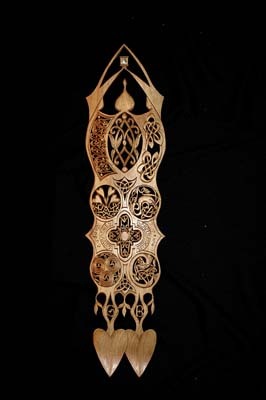 Islamo Celtic Celebration takes a more traditional approach, with a wide panelled spoon, echoing Welsh lovespoon convention. The design was created to celebrate a safe return from the Iraq war with a design which was rich in Islamic and Celtic images. In order to contain the volume of personal detail requested, it utilises an expansive panel with double bowls used to span the handle's broader width. Because a design of this sort can easily get too heavy, a large number of fretted areas help to reduce both the physical and visual weight of the design. The exterior curves make the frame appear lighter and more fluid than a blocky rectangular handle, and the interior fretting lightens the panel even further. This is probably the most important aspect of the design. The symbols and ideas included in your concept should have relevance to the recipient of the spoon. Consider any and all pieces of information before committing to a drawing. Ideas inspired by hobbies, travel adventures, nicknames and comical stories all make rich fodder for a really personalised design. 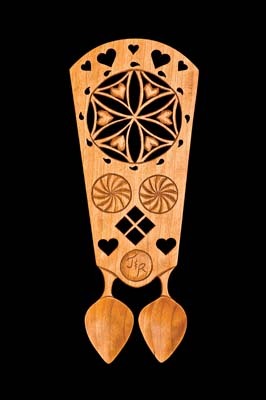 The trio of spoons above, commissioned for three adult children as a memorial for their recently deceased mother, all contain symbolism directly related to the family. From the individual animals symbolizing each child, to the number of leaves and grapes which occur in each spoon, every element has significance. This ability to tell a personal story is the lovespoon's strongest suit and is one which you should use to your greatest advantage. makes the difference between a successful design and a disaster. Unless you intend it, no one element should overwhelm the others and the entire design should look unified and like it belongs together. Try not to stack items up willy-nilly, but have them support and enhance one another. Notice how the elements in The Broken Road spoon rise up from the bowl in a believable order - the fish are at the bottom followed by reeds, the banner, knot work and the embracing couple. Each piece supports and enfolds the next, drawing the eye upward from the bowls to the crown. No one piece is dominant, and the eye is allowed to travel freely around the design. Whether the spoon is strictly symmetrical or is asymmetric, it must still feel balanced. Don't let the weight of the design become too heavy in any one area. Extreme symmetry, as illustrated by the Deco spoon on the left, can sometimes get monotonous if the repetition becomes too predictable. Extreme asymmetry, as illustrated by the Swallow Spoon can lead to visual awkwardness and unsteadiness if the balance points aren't kept firmly under control. Closely linked to composition, the way in which you size the elements of your design has an effect on their visual believability and the way they work with one another. The lines you use should reflect what you are trying to achieve with the design. Organic and free-flowing styles, such as Hilary's Garden require curvaceous, sweeping lines, while Rhiannon is much more geometric and requires harder, straighter lines. Although all this may seem rather a lot to get your head around, most of these design elements work together when you are designing, and you rarely have to consciously grapple with each one individually as you draw. The main thing is to simply 'have a go' and enjoy the opportunity to express yourself doing something you enjoy. straight out of the gate. Creating a lovespoon really is a pleasurable and gratifying venture. It is one you can savour and which has the added bonus of rewarding you with a beautiful gift that you will be proud to give, and which will be received with delight... and there's nothing wrong with that!